In your quest for new and different experiences, have you sought out a floating place to sleep? The Green Turtle Floating Bed and Breakfast offers up not one, not two, but three different vessels to call home for a night. While you stay there, safely docked in the historic Charleston Navy Yard, you can fall asleep to the calming rock of the ocean and awake to salty air and a view across the bay to the Boston skyline. The original boat, Green Turtle I, is a cute little houseboat which has traded a white picket fence for a dock instead. It still offers a patio with chairs and window boxes full of flowers, though. Split into two units, named Loggerhead and Sea Turtle, the Green Turtle I provides each suite with a kitchenette, in suite washroom, and of course breakfast which is placed outside your room each day. Amenities are not lacking. You can still watch a flat screen TV, stay online with Wi-Fi and relax in air-conditioned comfort, as well as enjoy all of the standard hotel fare like ironing boards. The queen size bed in each suite is appointed with luxurious linens. The Green Turtle II is a 45 foot yacht featuring two complete staterooms, as well as the ability to sleep up to six when all of the berths are utilized. Rent a single room or the entire ship; the choice is yours. As one would expect on a yacht, there is wall to wall woodwork, brass accents and a galley kitchen. Each stateroom includes a private bathroom and shower. There is Wi-Fi, a full refrigerator, air conditioning and heat, a microwave and queen sized beds. Step on board and call it your own for the night. At this point, the ship names have tradition to adhere to, right? Rounding out the fleet is the Green Turtle III. The vessel is a 43 yacht that also features two staterooms. Much like the Green Turtle II, it is wall to wall wood and finished just as one would expect. 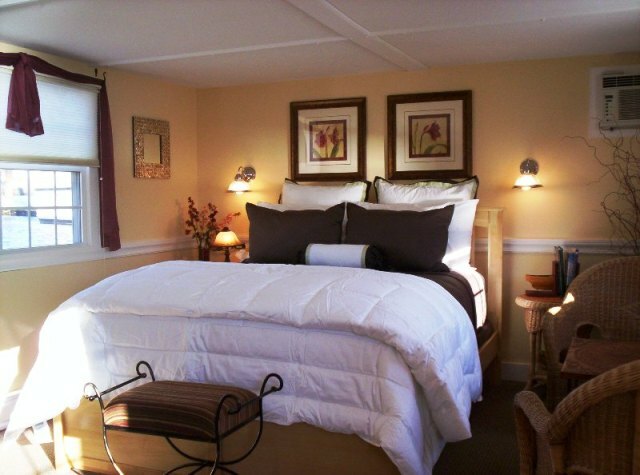 Queen sized beds and luxury linens await. You can spend your downtime reading in the shared common area or sitting on the bow in the sun. This ship features all of the creature comforts of the others. Children are welcome to stay in all of the Green Turtle suites, however they must be supervised at all times. All of the suites are non-smoking; smoking is permitted outside, on the dock. Each kitchen is stocked with gourmet coffee, tea, juice, yogurt, water and snacks. Call yourself captain for a night, and rock away to sleep in this unique B&B, in Charleston, MA. You may just have to come back and try each of the different rooms at the Green Turtle Floating Bed and Breakfast, as they each boast a uniqueness and charm of their own.